It seems appropriate with Easter around the corner that I am focusing on chocolate -leaving aside the real meaning of the Easter festival for another time and another place. 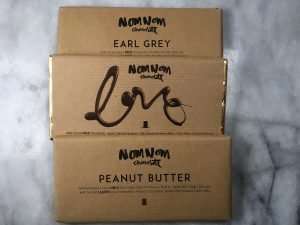 I have recently discovered NomNom chocolate which I buy from souschef.co.uk. You can also purchase straight from their website nomnom.cymru. Before you shop it is worth watching the charming film to find out about this great little Welsh company. My current addiction is the Peanut Butter bar (no surprise) but the Love bar -a divine salted caramel – using smoked Halen Môn salt, may well usurp the PB bar in my affections. Keeping your knives sharp is one of the most important kitchen jobs -and one which few people do. Not only is it dangerous to slice and chop with a blunt implement, it takes twice as long. In almost every kitchen I work, both in a professional and private capacity, the knives don’t cut (sorry) the mustard. Carting round a chef’s steel to sharpen knives is not often practical so this little gem is one of the most important pieces of equipment I own. 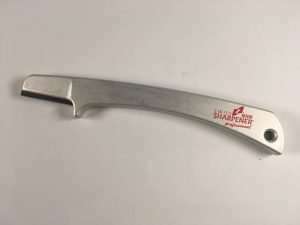 It sharpens knives beautifully and you don’t need any skill to use it. It’ll give a sharp edge to most things -scissors, secateurs, loppers etc. The model pictured is about 15 years old and shaped slightly differently from the sharpeners sold now but the principle is the same. It costs about £18-20 from www.amazon.co.uk and Lakeland -money well spent IMO. I think I love the leftovers from Christmas Day more than the lunch/dinner itself. I don’t make a massive effort on Boxing Day, apart from throwing together a couple of tasty salads to go with cold turkey and ham. After that though, one needs to be a bit creative to avoid moans of “not turkey AGAIN”. This year, steering clear of the ubiquitous curry I have whipped up a twist on the Italian classic- turkey tonnato, no less. Put 120g tin drained tuna in a food processor with 100ml mayonnaise, 90ml crème fraiche, 4 anchovies and the juice of ½ lemon. 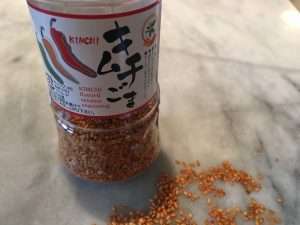 Blend until smooth and season with a little salt and ground black pepper. 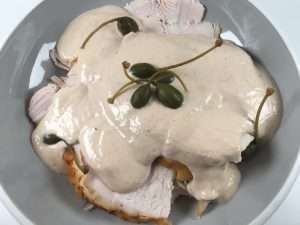 Spoon over some thinly sliced turkey and decorate with caperberries. Drowning under Stilton? Make little turnovers using a 320g sheet of puff pastry, 90g crumbled Stilton mixed with 50g cream cheese and either some leftover chutney (my quince chutney goes very well with blue cheese) or cranberry sauce. Cut six 12cm rounds out of the pastry, put a good tablespoon of the cheese mixture in the centre. Top with a teaspoon of chutney or cranberry sauce and brush the edges of the pastry with a little beaten egg. Bring the edges up together and pinch to seal. Brush with a little more egg and place on a baking tray. Cook in a pre-heated oven 200˚c, fan oven 180˚c, mark 6 for about 18-20 minutes until puffed and golden brown. I fall for it every year: the excuse to buy all manner of delicious food, from glossy marrons glacés to fiercely expensive jamon de bellota (you could enjoy a long weekend away for the price of a whole leg). The cupboards are already groaning with things that I think will be vital to the Christmas table. The cheese (mainly for Boxing Day and the week after-who can manage cheese with the turkey and pudding?) is ordered from The Courtyard Dairy. There must be a baby Stilton or slab of Stichelton, a Vacherin, a hunk of Cheddar and a soft goat’s cheese. I have chutney and sweet chilli jam already made but I can recommend Dukeshill chutneys-especially the Yorkshire Pickle and Christmas Fruit Chutney. Which brings me on to The Christmas Ham. A few years ago cooking the ham was the straw that broke the camel’s back, so I now order from Dukeshill. This year, as I’m not feeding a small army I’m plumping for their Tuscan style Baby Hams. However, they have Wiltshire and York hams and a fab porchetta joint to tempt. Inverawe smoked salmon or trout is consistently good-I like the balance of salt and oiliness. If you want some Christmas stocking and present ideas for your nearest and dearest sybarite, try The Fine Food Specialist and Souschef. As I’ve made my own chocolates this year (recipe to follow) I’m not ordering in, but William Curley chocolate are hard to beat. Eat, drink and be merry. I don’t fry very often so I can’t claim the deep fryer gets used on a regular basis but it is still a piece of equipment I wouldn’t be without. As much as anything it is the fact that the temperature is regulated so you can fry safely without fear of the oil bursting into flames. My De Longhi model is no longer available but I would opt for a fryer that you can drain easily-mine has a handy little tap that opens a valve-and one whose parts will go in the dishwasher. Cleaning a deep-fryer by hand is horrible. If you are cooking for a family I would suggest buying a big 3 litre model-it does use an awful lot of oil but you don’t want to be endlessly frying small batches of food. Unless I’m frying fish (in which case I discard the smelly oil) I’ll use the oil twice, maybe three times. I’m not convinced there is a deep-fryer on the market that totally eradicates the smell of frying. Some claim to have filters in their lids which help to contain odour, but I don’t think any work brilliantly. However that is the only negative. Deep-fryers are pretty reasonable-about £50 should buy a decent one. 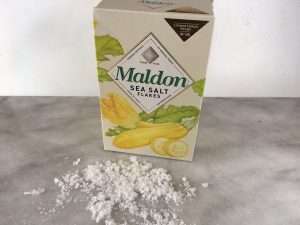 It might seem strange to recommend a salt when every bit of health advice warns us of the dangers of a high sodium diet but, I think a little sprinkle of Maldon salt is transformative and, don’t forget, salt is essential for life. The way I see it, if you are cooking from scratch you can see how much salt is going into the food and therefore you can control the quantities. On the other hand, a ready meal or takeaway is usually loaded with hidden salt (and sugar for that matter, but that’s for another day). It is all very well having the nutritional info on packaging but most people don’t know what any of it means, especially when it comes to sodium vs. salt intake. For me, salt brings out the flavour of food-as long as you are not too heavy-handed. The perfect example of this is the way plain chocolate is brought to life with the addition of a hint of salt-but it has to be Maldon. I like nothing better than a plate of steamed vegetables unadorned save a drizzle of olive oil and a pinch of Maldon salt. Or try some crunchy radishes eaten the French way-with some unsalted butter and a few flakes of Maldon. Finally, the humble tomato sandwich: good bread, unsalted butter, sun-drenched tomatoes (preferably home-grown) and Maldon salt. Nothing simpler and nothing better. I realise that a set of electronic scales is a prerequisite for my job but I think every household should stock a set. Unless you are still cooking from Mrs Beeton I don’t see how you can use the old-fashioned dial scales-they simply aren’t accurate enough. A lot of old handwritten recipes that I inherited from my mother and grandmother naturally are written in imperial measurements, but you can choose imperial or metric settings on almost all electronic scales. You can also measure litres and fluid ounces and re-set the scales to zero when you want to add lots of ingredients. I have 2 sets, one from Terraillon and one from Salter. 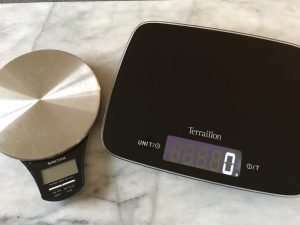 Both are good but the Terraillon scales are more versatile as they go up to 15kg compared with the Salter at 5kg. You can buy them on Amazon-just click on Buy Now. A Thermapen might not seem like the most vital piece of kitchen equipment but it takes the guesswork out of your cooking – especially useful when cooking meat and fish. Trying to tell whether a thick piece of meat is rare, medium or well done is not easy, even for the most experienced cook. 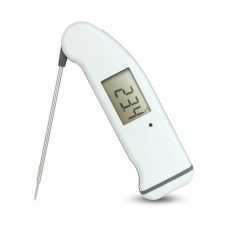 The Thermapen allows you to read the core temperature of your meat or fish so you can tell its doneness perfectly. It is also invaluable when making custard or other sauces that can curdle if they are too hot. You might not think you need a Thermapen but I can guarantee, once you’ve got it you will find yourself using it – a lot.